The hoof is one of the more complex aspects to consider when evaluating structural soundness. Problems with the hoof, such as excessive or uneven toe growth, may be caused by genetic, nutritional, or environmental factors or may be indicative of other concerns the animal may face structurally. The ideal hoof is free of cracks and other abnormalities and has two symmetrical claws that both point forward. The hoof shown in Figure 1 is an example of good structure in regard to symmetry and toe alignment. 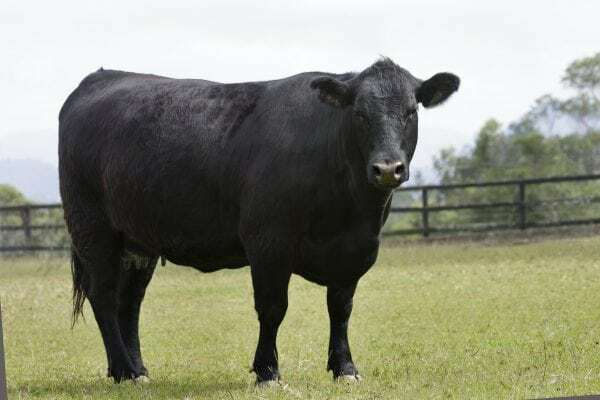 Adequate attention should also be paid to the amount of heel depth because cattle with too much angle to their hocks and pasterns can be very shallow in the heel. The hoof should be dense and able to support the weight of the animal without cracking, as this can lead to lameness. Another condition to look out for when evaluating the hoof is corkscrew claw, or screw claw, which is the twisting of the toe in a way that places the side wall of the hoof in direct contact with the ground. Sometimes the condition begins to show itself with the toes pointing inward instead of forward. The feet shown in Figure 2 exhibit the classical symptoms of this disorder, which is usually seen in cattle more than 2 years old. It can affect all hooves or be present in just one hoof. Although the mode of inheritance is not completely understood, this disorder is believed to be a heritable trait. The condition can lead to lameness due to improper distribution of weight within the toe. Cattle with this disorder should be culled and eliminated from the herd as soon as possible.